On the 30th (Tue), take in breathtaking views at Antelope Canyon. 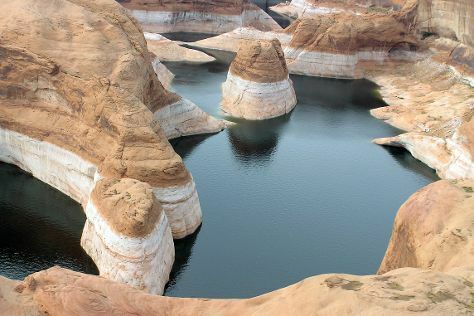 On the 1st (Wed), you'll have a packed day of sightseeing: explore the wealth of natural beauty at Glen Canyon National Recreation Area. For photos, reviews, where to stay, and tourist information, you can read our Page travel route planner . Cincinnati to Page is an approximately 7-hour flight. You can also do a combination of bus and flight; or drive. The time zone changes from Eastern Standard Time (EST) to Mountain Standard Time (MST), which is usually a -2 hour difference. When traveling from Cincinnati in April, plan for somewhat warmer days in Page, with highs around 72°F, while nights are about the same with lows around 48°F. Finish up your sightseeing early on the 2nd (Thu) so you can go by car to Grand Canyon National Park. Start off your visit on the 3rd (Fri): trek along South Kaibab Trail, take some stellar pictures from Yaki Point, and then take in breathtaking views at Grand Canyon South Rim. Get ready for a full day of sightseeing on the 4th (Sat): take some stellar pictures from Powell Point, then trek along Rim Trail, and then take in breathtaking views at Yavapai Point. You can drive from Page to Grand Canyon National Park in 2.5 hours. While traveling from Page, expect a bit cooler days and colder nights in Grand Canyon National Park, ranging from highs of 68°F to lows of 33°F. Finish your sightseeing early on the 4th (Sat) so you can drive to Sedona. Visiting Fay Canyon Trail and Soldier Pass will get you outdoors. Eschew the tourist crowds and head to Historic Old Town Cottonwood and Amitabha Stupa & Peace Park. Step out of Sedona with an excursion to Tuzigoot National Monument in Clarkdale--about 34 minutes away. There's much more to do: tour the pleasant surroundings at Doe Mountain Trail, explore the striking landscape at Snoopy Rock, learn about winemaking at Page Springs Cellars, and grab your bike and head to Little Horse Trail. To find maps, more things to do, and tourist information, read Sedona trip planning site . You can drive from Grand Canyon National Park to Sedona in 2.5 hours. Traveling from Grand Canyon National Park in May, expect nights in Sedona to be much warmer, around 54°F, while days are somewhat warmer, around 78°F. Wrap up your sightseeing on the 7th (Tue) to allow time to drive to Phoenix. Phoenix is the capital and most populous city of the U.S. To find other places to visit, where to stay, photos, and other tourist information, go to the Phoenix trip planner . You can drive from Sedona to Phoenix in 2.5 hours. Other options are to do a combination of taxi and flight; or take a shuttle. Traveling from Sedona in May, expect Phoenix to be a bit warmer, temps between 93°F and 69°F. Finish your sightseeing early on the 8th (Wed) so you can travel back home.